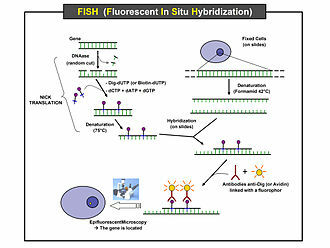 Fluorescence in situ hybridization (FISH) is a molecular cytogenetic technique that uses fluorescent probes that bind to only those parts of a nucleic acid sequence with a high degree of sequence complementarity. It was developed by biomedical researchers in the early 1980s to detect and localize the presence or absence of specific DNA sequences on chromosomes. Fluorescence microscopy can be used to find out where the fluorescent probe is bound to the chromosomes. FISH is often used for finding specific features in DNA for use in genetic counseling, medicine, and species identification. FISH can also be used to detect and localize specific RNA targets (mRNA, lncRNA and miRNA) in cells, circulating tumor cells, and tissue samples. In this context, it can help define the spatial-temporal patterns of gene expression within cells and tissues. A metaphase cell positive for the bcr/abl rearrangement (associated with chronic myelogenous leukemia) using FISH. The chromosomes can be seen in blue. 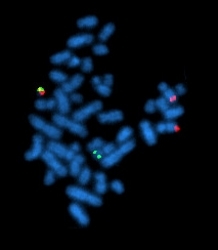 The chromosome that is labeled with green and red spots (upper left) is the one where the rearrangement is present. ViewRNA detection of miR-133(green) and myogenin mRNA (red) in C2C12 differentiating cells. Scheme of the principle of the FISH Experiment to localize a gene in the nucleus. First, a probe is constructed. The probe must be large enough to hybridize specifically with its target but not so large as to impede the hybridization process. The probe is tagged directly with fluorophores, with targets for antibodies or with biotin. Tagging can be done in various ways, such as nick translation, or Polymerase chain reaction using tagged nucleotides. Then, an interphase or metaphase chromosome preparation is produced. The chromosomes are firmly attached to a substrate, usually glass. Repetitive DNA sequences must be blocked by adding short fragments of DNA to the sample. The probe is then applied to the chromosome DNA and incubated for approximately 12 hours while hybridizing. Several wash steps remove all unhybridized or partially hybridized probes. The results are then visualized and quantified using a microscope that is capable of exciting the dye and recording images. Chromogenic in situ hybridization (CISH) is a cytogenetic technique that combines the chromogenic signal detection method of immunohistochemistry (IHC) techniques with in situ hybridization. It was developed around the year 2000 as an alternative to fluorescence in situ hybridization (FISH) for detection of HER-2/neu oncogene amplification. CISH is similar to FISH in that they are both in situ hybridization techniques used to detect the presence or absence of specific regions of DNA. However, CISH is much more practical in diagnostic laboratories because it uses bright-field microscopes rather than the more expensive and complicated fluorescence microscopes used in FISH. Probe design for CISH is very similar to that for FISH with differences only in labelling and detection. FISH probes are generally labelled with a variety of different fluorescent tags and can only be detected under a fluorescence microscope, whereas CISH probes are labelled with biotin or digoxigenin  and can be detected using a bright-field microscope after other treatment steps have been applied. CISH probes are approximately 20 nucleotides in length and are designed for DNA targets. They are complementary to the targeted sequence and bind to it after a denaturation and hybridization step. Only a few CISH probes are available commercially, so for most applications they have to be extracted, amplified, sequenced, labelled and mapped from bacterial artificial chromosomes (BACs). BACs were developed during the Human Genome Project as it was necessary to isolate and amplify short fragments of human DNA for sequencing purposes. Nowadays, BACs can be selected and positioned on the human genome using public databases such as the UCSC Genome Browser. This ensures optimal complementarity and sequence specificity. DNA is extracted from the BAC clones and amplified using a polymerase-based technique, such as degenerate oligonucleotide primed (DOP)-PCR. Next, the clones are sequenced and their position on the genome is verified. Probe labelling can be carried out by using either random priming or nick translation to incorporate biotin or digoxigenin. CISH has some advantages over FISH in the reagents and equipment it uses. As noted above, CISH is much cheaper and is easier to use because it uses bright-field microscopes instead of fluorescence microscopes. In addition, the CISH reagents are more stable than the FISH reagents so it is possible to store the samples and examine the same sample multiple times. FISH reagents fade over time due to photobleaching so a sample can only be examined once. Apart from the expensive fluorescence microscope, FISH also requires a high-resolution digital camera to capture micrographs of the sample before the fluorescence fades. Another advantage of using bright-field microscopy is that the tissue or cell sample as a whole can be visualized through CISH whereas cell morphology is difficult to assess using fluorescence microscopy in FISH. CISH also differs from FISH in the probes that are used as well as in the overall method. There are many different types of FISH probes available, such as repeat probes, probes that detect specific genes or telomeres, and probes that detect chromosomal abnormalities. In contrast, there is a limited variety of commercially available CISH probes, including probes that bind the centromere of chromosomes 3, 7, 8, 9, 10, 11, 17, 18, X, and Y as well as gene-specific probes for cancer-related genes, such as HER-2, EGFR, MYC, and TOP2A. Despite the limited variety of available CISH probes, they are generally more cost-effective than FISH probes. With regard to the overall method, FISH can be performed using direct labelling—fluorochromes are attached to the probes—or indirect labelling—the probes are labelled with biotin or digoxigenin which are then detected using fluorescently-labelled streptavidin or antibodies, respectively. CISH is performed using indirect labelling in which antibodies or streptavidin are conjugated to enzymes such as HRP or alkaline phosphatase (AP). CISH and IHC are similar in that both are used for the same purpose (mainly to detect HER-2/neu amplification) and they both use enzyme reactions (HRP/AP) to measure amplification. CISH and IHC are different in that IHC measures protein expression whereas CISH measures DNA amplification. This difference is particularly useful for HER-2/neu because it has been found that gene amplification is of higher prognostic value than protein expression. 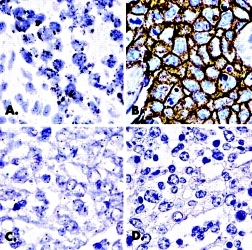 A disadvantage of IHC is that it is not possible to identify false-negative and false-positive results. In CISH, if there is no signal for the reference probe, the assay has failed. especifically, which leads to a higher concordance rate. For medium protein overexpression/gene amplification concordance varies, but is higher when monoclonal antibodies are used than when polyclonal antibodies are used. The variable concordance is due to the fact that gene amplification does not strictly correlate with protein expression and that tumor heterogeneity can make it difficult to detect protein overexpression in a tissue. CISH is frequently applied to assess Gene Amplification, such as HER-2/neu status in breast cancer samples. HER-2/neu amplification is associated with higher mortality, higher recurrence rate, and poor prognosis in breast cancer. The monoclonal antibody trastuzumab is a receptor blocker that has been proven to be clinically very effective in HER-2/neu-overexpressing tumors. Therefore, it is crucial to determine receptor status before starting cancer treatment. CISH is also used for detection of Chromosomal Rearrangements and fusions, such as the fusion of ALK tyrosine kinase domain with the promoter and 5’ region of EML4 in lung cancer. ALK-positive tumors are a clinically relevant subgroup as they can be very effectively treated with the ALK inhibitor crizotinib. Apart from cancers, CISH has also been shown to be useful in detecting human papillomavirus infections. Our partners, the Empire Genomics, being a leading professional developer and manufacturer dedicated for custom labeled Molecular Probes for bioscience research and Clinical diagnostic applications, including the Fluorescence in situ hybridization (FISH) and Chromogenic in situ hybridization (CISH) probes. Logo of the HGP – the Vitruvian Man by Leonardo da Vinci. Empire Genomics designs, manufactures and distributes more than one million clinical and custom labeled molecular probes, enabling hundreds of leading global clinical laboratories, biotechnology organizations and academic institutions to advance biomarker research, accelerate diagnoses and improve personalized treatment options for patients battling cancer and other complex diseases. The company was founded in 2006 by Norma J. Nowak, PhD, a prominent member of the Human Genome Project, to utilize innovative research started at the prestigious Roswell Park Cancer Institute in Buffalo, New York. Extensive and mass amount of routine categories and customizable items are available, ranging from probes for Gene, Clinical Panels, Disease, Region, Fusion, Break Apart, Controls, Human BAC, and Mouse BAC, and Rapid Hybridzation Buffer, etc.